For years Jacques Anquetil didn’t know what to do. As much as he’d win he couldn’t beat the popularity of Raymond Poulidor. The more Anquetil beat Poulidor, the more popular “Pou-Pou” became. The public love an underdog and sometimes Poulidor wasn’t beaten by a superior rider, he was undone by misfortune. He would have won where it not for some random incident like a puncture or a crash. While Anquetil avoided potholes or stayed upright his rival was wiping out but also becoming increasingly popular. Decade after decade cycling has celebrated the “moral winner”, the rider who should have won but was thwarted by the cruelty of sport. Who was the first moral winner? Who knows, there are many ancient tales of hard work being thwarted. Achilles the battlefield hero undone by an arrow to his heel, Orpheus the gifted musician reduced to rescuing his wife. Skip 2,500 years and René Vietto made a name for himself in the 1934 Tour de France. 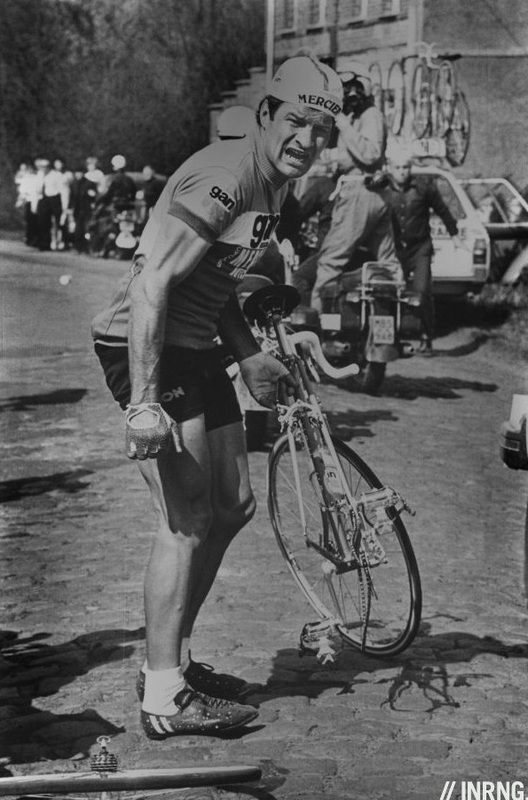 Previous Tour winner Antonin Magne broke his front wheel so French team mate Vietto offered his front wheel – familiar theme – but it didn’t fit. 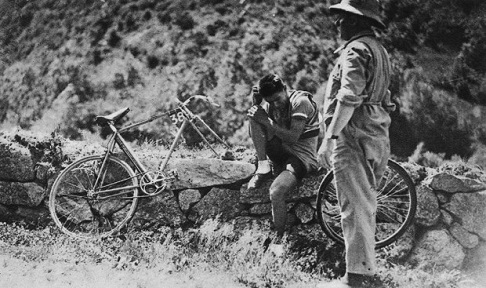 So another team mate and 1933 Tour winner Georges Speicher stopped and gave his wheel to Magne and then Speicher grabbed Vietto’s wheel leaving Vietto folorn by the road until the team car showed up. Vietto lost four minutes. The next day Magne’s chain snapped and Vietto surrendered his bike and lost another four minutes. 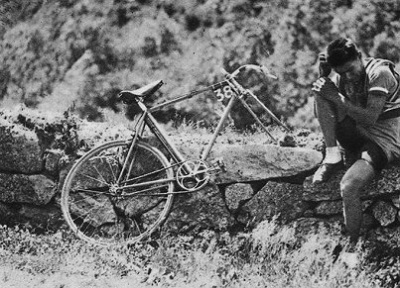 All this was normal in the race at the time recounts Benjo Maso in his book “The Sweat of Gods” but the difference was that Vietto was photographed sitting on a low wall looking sorry for himself, his bike missing its front wheel. The image was cropped to remove others from the shot to pretend Vietto was left alone write Maso and the photo was used to write up the story of Vietto sacrificing his chances for his leader. Magne went onto win the Tour de France but by the time he made it to Paris the story of Vietto had got out of control and many were led to believe by newpaper reports that Vietto could and should have won the Tour de France despite being slower than Magne and others. Magne was not allowed to do his victory lap on the track in Paris without Vietto by his side says Maso and banners were waived displaying “Long Live René Vietto, moral winner of the Tour”. Vietto earned a small fortune from this popularity. There have been other moral winners. 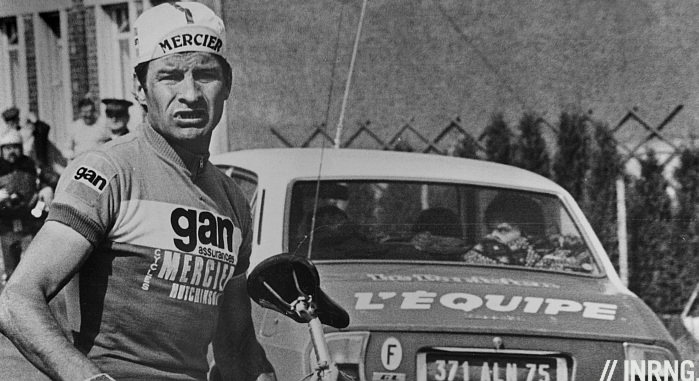 As mentioned above Raymond Poulidor played up the myth of being the eternal second and became wildly popular. This theme is even sent up for comic effect in “Le Vélo de Ghislain Lambert” a Belgian film from 2001 where Lambert is last man in the Tour de France but his efforts to ride make him wildly popular. It’s art imitating sporting reality. It doesn’t always have to be a loser, Greg LeMond’s 1986 triumph in the Tour de France was arguably boosted by his triumph over team mate Bernard Hinault. In more recent times there was no doubting Vincenzo Nibali’s superiority over Jean Christophe Péraud and Thibaut Pinot but some were questioning the value of his win in the absence of Alberto Contador and Chris Froome. Even if you’re fine with the win you’ll probably want to see a rematch with Contador and Froome present this July. Nairo Quintana’s lead in the Giro was almost accompanied by an asterisk and with “*Stelvio descent” written in people’s minds until he stormed the Monte Grappa time trial to convince people he was the best. A big difference today is that we can see everything that happens while stories of Vietto were embroidered by journalists keen to spin a yarn. Which brings us to Richie Porte. Nothing can be changed here because the rules are the rules but it’s this inflexibility that could have the public behind Porte. If he manages a good time trial and tracks his rivals in the mountains then people will say “if it wasn’t for that wheel change“or “if he hadn’t punctured” then he would have won. All this is in the conditional squared, after all he did puncture – “if he’d only looked where he was going he wouldn’t have smashed his front wheel into a pothole” and so on – and multiply this by uncertainty about the future, for all we know today Porte could crack spectacularly in the Alps. It works the other way too, sections of the Italian media have complained on the airwaves of RAI and the pages of La Gazzetta that Porte is hard to reach for post stage chats and interviews so perhaps they’re less inclined to defend his cause because even if you didn’t like the wheel change losing time just because a puncture is cruel. Either way there’s the coulda, woulda, shoulda aspect which makes extrapolation dangerous but it’s this space for doubt that changes things or at least keeps discussions going in bars and online forums. Cycling takes place in the great outdoors and all sorts of random and unexpected events can occur, the result of a race is so different from what would happen if we put 200 riders onto ergobikes in an indoor gym. The changing circumstances and drama involved bring suspense and make the sport so compelling. Even when the result is in the story doesn’t end. Today it’s harder to imagine the “moral winner” of a race enjoying such fervent support on their way to fourth place. A century ago the newspapers could be more creative and if not providing fiction, they were often telling stories with exaggeration or, in the case of Vietto’s “isolation” on the side of the road a cropped photo. Television has changed plenty and today’s the internet takes this a step further, the images of Porte’s wheel changed are shared around the world within minutes. But the concept still exists, it’s one thing to win a race but being the clear winner on fair terms helps win the public seal of approval and this still counts for something. Very few are winners in their everyday lives. But everyone can relate to having bad luck affect their lives, probably just as many can relate to having a rule or law unfairly (at least in their eyes) applied to them. I always thought of Evans as a moral winner of the last decade. He lost the 2007 Tour to Contador who had the benefit of chasing Rasmussen op the mountains. Then lost the Vuelta to Valverde due to a puncture. Take people with questionable pasts out of the LBL results and he’s on the podium every year. Many people feel similarly for Moncoutié. Not doping related, but even when he would lose a race I always felt Cancellara was the moral winner lacking a fast finish. Cancellara? Lacking a fast finish (something on which he has worked during the last years) is one of his technical characteristic. It depends, among other things, on that same combinations of fibers in his muscles which otherwise proves itself so good to make him a champion thanks to the other possibilities it grants him. He complained a lot about people not cooperating with him… well, he just wasn’t used to see life through the eyes of a fast finisher. You don’t find a Terprstra or a Paulinho everyday. As for Moncoutié… well, I see him as a winner, full stop. A winner in life 🙂 He didn’t win more in the sport not only because of doping but also because of his admirable attitude in terms of life priorities – which probably would have prevented him to win that much more, anyway (if what you read about him, including what inrng reported of his autobiography, is true: I don’t know him personally, so I couldn’t really say, I’m speaking of his public image). If you “Take people with questionable pasts out of the LBL results…” the he’s not in the results. Just sayin’..
a massive +1 to Evans, one of those riders with an unimpeachable reputation who suffered from being around at the wrong time. And speaking of crashes in the 3K to go mark, today’s stage finishing with a game-changing crash just outside the 3K mark has resulted in Aru, the native son, putting on pink on the podium. If this is not a conspiracy, then you couldn’t make this stuff up. Top 3 are all Italians and Aru is the only top GC contender not held up by the crash. Porte, of course, has lost even more time and looks like he’s given up the “moral” fight. I hope there was “tongue-in-cheek” as you typed that comment? Porte seems well-and-truly out of the Giro for 2015 and most of the blame can be put on SKY rather than any conspiracy. I’d also point out the guy running Aru’s team (Giuseppe Martinelli) probably has more experience and cycling knowledge in his little finger than the guys running SKY and Tinkoff added together. W Il Giro! So come on then Larry T, let’s here your fantastical yarn that weaves a magical web with the result that Sky can be blamed for a puncture and a crash in the peloton. This is just simple bad luck. Sky didn’t know it was going to happen anymore than you did. Some sad sacks are sooooo desperate to knock people and teams they don’t like. These are just the kind of “fans” cycling doesn’t need. PS I’d be happy to put Sky’s palmares up against yours. After all, you know so much, right? SirRogerMoore, I’m really sorry for Porte, but it wasn’t “just simple bad luck”. The way he and the team behaved on Monday is plagued by errors; I don’t know about today, but I’d guess more or less the same can be said. Even worse, apparently they didn’t learn from Monday. Road cycling is held in an open, complex, chaotic environment: adverse contingencies are part of the sport, and the skills to cope with them are paramount. A cold mind to react the best possible way, the deeply needed character not to resign yourself, creativity to change your plans according to the new circumstances. It’s not only about the Watts. Larry is probably a bit more sardonic than a Sky/Porte fan is ready to endure in an emotionally challenging moment, still he makes kind of a point that the same Sky should well take into consideration for the future. From the photograph on Cycling Weekly it looks like he has already given up any hope for the Giro. Guessing & Stereotyping, Dear Gabriele, I suppose those are all you needed when criticising about the team you don’t like, let truth be dammed. You guys are not criticising Sky’s ability to protect their team leader here. Rather, you are taking fun out of misfortune of Porte, which is pretty un-sporty & totally against the spirit of Inner Ring’s blog. Speaking of Sky’s ability to protect their team leader, Wiggins never had an incident during his 2012 tour campaign & Froome was never in any serious trouble during his 2013 campaign. Not guessing at all. Others maybe are. When the peloton is riding hard, like the last kms of a stage (and not only then) you should always keep a rider *behind* your captain, to start with. Possibly the gregario with the most similar bike size. Generally, the guy is also spending some more energy just to keep a little bit of extra distance between his front wheel and his captain’s back wheel, to have time to follow him if he goes around in a corn field, if he takes the wrong road, and to protect him if someone is bumping in from behind while at the same time not hitting him should he suddendly stop. Probably, Porte would have lost some 40 secs instead of nearly 5 mins. It’s that simple, 40″ of bad luck, 4′ of consequences from their errors. Lots of other details, but this is pretty basic. And how the hell did König arrive some 7″ ahead of Porte today? Don’t tell me they weren’t riding together… (couldn’t see images again). Tour 2012 wasn’t exactly the best example of team spirit that comes to my mind, and they messed it up a bit in Vuelta 2011, too. Nor I remember an impeccable managing of Dauphinée 2014. Part of Froome’s troubles in that same year’s Tour dependend on the kind of error I detailed above. That said, I’m not saying that Sky isn’t generally able to protect their captain, I’m saying they were responsible of a significant part of Porte’s delay in GC *this year*. Accidents happen, but sometime – not always – you can stand negative circumstances and reduce their impact. This clearly wasn’t the case. And, to make that clear, too, I’m not taking any fun of Porte, which is a rider I don’t dislike at all, as I acknowledged well before his misfortune started. Gabriele there are a few other factors involved in the time factor here that we could also consider. Firstly Porte crashed and he hurt himself. Nowhere in your analysis have you taken this into account. It is as if you expect him in the first instance that he can get straight back on a bike and go. It has been widely reported that Porte said at the end of the race that his knee is “F’d”. Now I don’t know about you but he might have thought his race was over. I am not sure about this next part but the early list of rider places showed Salvatore Puccio coming in ahead of Eisel and Porte. As we know it was actually Konig who came in ahead of Eisel. This could suggest that Konig’s bike was also damaged and he was on Puccio’s bike. As there were two sky riders up the road and 2 right out the back this would suggest that the only bike left was KIRYIENKA’s. Either way the only riders in the team anywhere near Porte’s in size were not near him as they have different jobs in the team. As far as team positioning goes Aru was lucky as the crash happened right behind him. As far as his team goes however, according to your analysis they completely failed him. His entire team was behind sky with nobody protecting him. Two astana riders also fell in the crash one on top of Porte. Contador was also by himself with his entire team several bike lengths behind him. This wasn’t a team sky mistake it was made by many teams. Aru made his own luck. Contador was lucky to be less injured and have a similar size bike available. In summary, Sky was the only team to have 4 riders with their leader. The only rider of these 5 that he was even close in size to (still about 5cm taller) was higher in GC and given the state of Porte’s knee possibly considered the best chance on GC for Sky. There was no chance to get a new bike off the car as it would have taken minutes due to the stopped convoy and chaos at the back of the race. Taking all this into account an unbiased observer would see that Sky made very few if any mistakes and made the best of a bad situation. As to the rest of the time he lost all but the most biased would say that 47 sec was bad luck to puncture at a point where you couldn’t have your team immediately stop and 2min was all on Porte panicking not team SKY. He made a rookie error that would have been easily rectified if he waited the extra 10sec for his team. So, little error from Team SKY and big error from Porte. The rest bad luck. Sorry to say this, and, believe me, no intention to be offensive on my part, but your analysis is pretty poor, hence I’m not very inclined to discuss it in detail or longer than this post. Suffice it to say that Nieve and Henao, not only König, have quite the same bike size as Porte. Nieve was ahead, but not in the first group, and could well be stopped, if the team wanted so. Despite the time he gained yesterday, he’s still 3′ down on Porte and 8′ down on the Maglia Rosa. Maybe he’ll win the Giro and Sky we’ll have guessed right, but I don’t think so. Henao arrived half a minute behind Porte. We don’t know everything that was happening, but I’d say that taking Henao’s bike and having Kiryenka pulling Porte towards the finish line would have been another interesting option. What sort of “different jobs” were these two up to? No need to say that even on a small distance as 3-4kms two riders working together can go way faster than a single rider: that is, utter nonsense having Eisel “chasing” König, even more so given the few seconds which König gained thanks to the decision of not stopping to help the couple of teammates behind him. Even if Sky knew that Porte’s Giro was finished because of his knee (which I doubt anyone can be aware of in such a short time, see Contador trying to ride with a brok-… cracked leg, or other riders desiring to retire just to discover they weren’t that hurt), working together could have been a good idea. I don’t think Porte lost much time yesterday strictly because of the knee (did König get injured, too? ), flowing adrenaline generally helps a lot. It will be a big factor in the next stages, but not in present GC. Moreover, you seem to ignore the basic “bodyguarding” tactics I’ve described above. Failing to apply that was paramount on Monday, and probably again yesterday (Henao or Nieve could be the man). “Protecting the leader” is not just “staying ahead of him”, sometimes it’s “staying behind him”. That said, Astana and Aru were far from perfect, theoretically he was too far on the front (! ), but practically this turned out to be good for him: the fact that he was isolated has been noticed and criticised by most (Italian) observers. He’s been obviously very lucky, but that doesn’t mean that his team was working well in this specific occasion, nor does this justify other teams’ errors. Tinkoff, instead, did it quite good. Contador pulled the last stretch to the line as it is customary when a GC man is in a chasing group (I guess you too have seen that hundreds of times), but he wasn’t at all that isolated. He received the needed bike exchange and still had *two* teammates working with him, Rogers and Boaro, which eventually also made unnecessary to stop Kreuziger. I don’t mean that Sky are a *bad* team, generally speaking, but they’re prone to mistakes in some specific situations. Other teams may go wrong, too, and they do, but what is relevant is that this week Porte’s delay wasn’t just “bad luck” (and there’s a responsibility from Porte himself, too, I agree, but that doesn’t reduce the team’s). That said, the bodyguard’s function is trying to prevent this situation, usually keeping some ten inches more than ideal space between his wheel and the captain’s. It obviously isn’t authomatically working, e. g., if they hit you very hard and the likes. But it helps a lot (the rider on the back would have hit directly the captain, instead). I don’t have HD on this, are you sure that Porte was the guy ahead in the Sky couple? I’ve got the impression he may be the one on the back, possibly behind Kiryenka. The front rider looks a bit more corpulent when they fall on their side, hit by an Astana truck. Gabriele, below you are making good, knowledgeable, unbiased points – as per usual. And, as per usual, others are allowing their biases to overwhelm them and thus accuse anyone criticising Sky as being a hater or suchlike. As you say, if Porte had a rider behind him in both incidents – as he should have – he would probably have lost under a minute. Anyone who is both neutral and knows about cycling knows that this is the case. I meant the posts above. One person (Gabriele, obviously) is making good, solid points that anyone with knowledge can see; the others (ostensibly biased by their fandom) are making desperate and incorrect points (and as for the conspiracy theories – please). Nieve/Henao behind Porte. Simple. Far less time lost. See: Contador after yesterday’s crash. So, they conspired to crash? You could make that up, because you did. Watching the replay, it seemed to me that Contador and Porte re-mount within a second of each other – Contador getting a bike from team mate on the right; Porte – centre of the road – gets on his bike (comes out from under the tree on the helicopter shot) at the same time as Contador. So, why did he end up finishing 1.5 minutes slower than Contador? However, in the melee and with rain jackets on, etc. I could have been looking at the wrong bloke. Certainly, there were three Sky riders who rode off at the same time as Contador, so if Porte didn’t get one of those bikes one really has to ask why not? One reason will be that he had Kiryienka’s bike which is way too big for him and he had to stand on the pedals for 3kms. So why didn’t he take Konig’s bike? Probably because Sky aren’t prepared to sacrifice Konig for Porte. It’s 3 km!! If I have to read how standing made him lose all that time again I’m going to throw a fit. If he can’t keep up a fast pace for 3km out of the saddle the he should quit cycling. There may have been other reasons, but this one is just dumb. Ok, it sounds like he hurt his knee. That makes sense. Better reason. According to Cioni, there is no injury. Standard practice: have a rider of a similar size behind your leader. If Sky had done that on both occasions, very little time lost. It’s time their fans accept that fact. J Evans: slow down, you don’t need to police other people’s comments so aggressively. Note it’s not always easy to ensure an identical sized rider is ready beside you in the finish of a race. Even when a couple of people are suggesting that the crash was deliberate?
? I looked at the footage and it was a clash between Lotto-Jumbo and a rider in white (Trek?) that caused it. Weird conspiracy theories you have. The way Quintana’s Stelviogate has been passed over to most fans’ shared knowledge would be another very interesting case. It wasn’t mainly a *sneaky move* by Quintana nor a problem of rules, as much as a strategic error by the other teams’ DSs (especially Urán’s) and a serious tactical error by the other captains. Listening to the various radio messages makes it clear that there was, indeed, a matter of communication and the inopportune creation of an unusual situation by the organisation, still no full-descent neutralisation was ever discussed. People tend not to remember that the dangerous part of the descent, the one with motos and flags and so (not really neutralised, anyway) was about 3 kms out of a 25 kms long descent, which isn’t enough to neutralise a whole descent, let alone the stage as such (cancelling the stage had been debated during the Gavia, in case weather had become even worse, which didn’t happen). Nor is it usually pointed out that “preserving existing groups” would have meant also avoiding that a good number of gregari could easily come back to the front during that same descent. Truth is that most teams were afraid of finding themselves in a classics-style situation: when only few riders are left, and most of them are captains, if someone attacks, nobody in the following group wants to take responsibilities and sacrifice himself to chase. They decided to wait for the gregari, and hoped to neutralise the consequent time loss calling for a “safety car” situation, which really made a little sense. The captains made a gross mistake not keeping eyes (and wheels) well glued to each other. You must keep your eyes on your opponents and don’t lose their track for a single second, instead of giving priority to your ears and your DSs misleading suggestions. That’s what Quintana did when he saw Rolland and Hejsedal moving away: he knew how they had been behaving in previous stages and understood that it was an occasion to be seized. I’m pretty sure that more or less the same would have happened, in the same circumstances, even without the confusing red flags. Excellent summary and absolutely spot-on. I really can’t understand the ongoing polemic that basically highlights the incompetence of many DS’s and the so-called Road Captains. +1 I remember watching that stage live on TV and it unfolding as you describe. Great piece! Wonderful to read. On another note…Porte as a moral winner? Don’t think so. Don’t trust this guy’s results at all, nor his camper van. Nor his past as a tryathlete. Whereas Astana and Contador are ok because they’ve already been done? Sounds like you’re ready for a guest spot on RAI! I don’t seriously think there’s a conspiracy in play… but sometimes it’s funny how things turn out in the Bel Paese. Great piece! Riders who seem to win easily (though we know it’s rarely easy) don’t get much love from the fans, while the guys who try but fail often spark the passion that makes sport….SPORT! Struggling but gutsy Froome of the 2014 Vuelta won a lot more respect from cycling fans, I feel, than the unbeatable winning machine of the 2013 Tour. We are led to believe rooting for the under dog is a very British trait (I’m careful not to say Anglo-Saxon). Perhaps it isn’t so. It’s big elsewhere, take France where losing with style or panache is often celebrated more than a cold win. Rooting for the underdog and for stylish loosers is not uncommon in The Netherlands either. There’s endless debates around large football tournaments on whether the focus of the team should be on results or attractive play. There’s a difference between being the underdog and displaying style or panache though. They can go together but they’re not the same. Before Alberto was stripped and banned many held Andy Schleck as the moral winner of the 2010 Tour following “chain-gate”. Certainly it split opinions and made many people rather avid Andy fans ahead of the 2011 race where his mental attack on stage 18 again made him a real fan favorite when he finished on the podium again (though Evans chase was equally well loved so i’d call it morally even). I guess you could call Frommey a moral winner in 2012 when he was pretty clearly the better climber out of him and Wiggins and if he was allowed to attack would have won my minutes. Away from the GC Cavendish is a pretty good moral victory of the 2009 Green Jersey. Only being denied after 6 stage wins because he was DQ’d from the sprint on Stage 14. Every GT seems to throw up some unlucky or courageous soul who becomes a real fan favorite, a moral victor of some kind, even if they arn’t fighting for a GC or even a Jersey. It’s a great part of the sports history and one that is great to see continue each year. They’re obviously just opinions, no intention on my part to criticise your POV, just offering my perspective. In 2010 Andy incredibly failed to attack Alberto in phases of the races when it was apparent he could, hence showed he was lacking of the insight needed to be a proper winner (compare with Contador in Vuelta 2012… or, on a smaller scale, yesterday – however this Giro may end). It’s far from proven that Froome could gain the needed three-and-a-half minutes on Wiggins, even if he climbed better, in a Tour less suited to climber than… nearly any other Tour these years. Moreover, it’s way easier to *show* you’re stronger than attacking for real when you desperately need to gain time. The “invincible” 2013 Froome had a couple of significant hard moments, imagine if he was in a different position. Hushovd was a very deserving winner of that Tour’s Green Jersey, if you recall how he seized it. A true *moral* winner, fighting hard to make for what were his weak points in comparison with his rival. And I struggle to see as a *moral* winner someone who lost points because of behaving irregularly in a sprint – in which he theoretically should have had the upper hand. My turn to expose myself to similar observations… (always jokingly, I hope). It’s not like Hejsedal didn’t deserve it, but the fact that precisely that year rules were a bit different from usual, and, more than everything, the fact we’re speaking of Purito (moral World Champion 2013, moral co-winner of Vuelta 2012) makes it sooo clear in my eyes. Contador is the moral winner of Giro 2011, and Nibali would anyway be the moral winner if we accept Contador’s disqualification (the Shark lost time and energy on Scarponi going on the attack to try and win it all instead of contenting himself with 2nd place behind the Spaniard). I’d disagree about 2010 with Andy. He didn’t need to attack Alberto considering he was in the Yellow Jersey at that moment. Ok 31″ isn’t a lot especially considering Andys Time Trial skills but as Yellow he had no need to attack, better to save himself for the Tourmalet i think. If Cav’s hadn’t been disqualified on Stage 14 he’d have won the Jersey outright. Hushovd did a great job going out to bag Points at Intermediate Sprints, but he’d still have come up short against Cavendish. I’d contest that Cav’s should have been DQ’d on Stage14, it was quite a harsh call. And 6 Stage wins and not winning the Points Jersey in any GT makes you the moral winner because that’s a joke. Purito moral winner in WC 2013? Are you crazy?!! Rui Costa outplayed the dual Spaniards with excellent skill as they both threw away what should have been an easy Gold for Spain. You can’t have sympahty for either one there. Schleck’s chain: he gained more than twice that time after following Cancellara on the pave stage – the attack coming after Contador had been blocked by the crashing F. Schleck. Hushovd denied 2010 green jersey – losing it to Petacchi – because of Cancellara’s forced neutralisation of the stage. Hushovd would have picked up a bundle of points as Petacchi had been dropped. Cancellara was interested in bringing Schleck back up, not safety. Schleck lost to Evans because he wasn’t brave enough to attack in the Pyrenees – a lack of bravery being his biggest flaw. Evans denied two TDF victories by opponents’ cheating? Not sure about this one – confident that Sastre and Contador were, but not sure that Evans wasn’t. Purito threw away 2012 Giro and Vuelta. Nibali should have had the sense to know that he would never beat Contador and that Contador was bound to be banned. Schleck’s Galibier attack: most of the time was gained from the initial burst when the others let him go and then in the flat bit approaching the final climb, riding behind his team mate. On his own in the final climb, didn’t Schleck actually lose time? +1 Damn! I’m agree with you more than I like to admit. Certainly all who ride at the WT level have shared in the luck as well as the disappointment of bike racing. The shear mental and physical strain of stage racing is one of the more compelling reasons, I put it above the single day classics. The tragedy component Inrng articulates so well only magnifies the effort needed in stage racing to be one of the greats of cycling. Not many riders in the top ten in GC at the conclusion of a grand tour is a result of luck or simple circumstance! For outside assistance, Porte gets penalised but Meersman doesn’t. For taking his helmet off, Contador doesn’t get dq’ed (neither others). Sticky bottles, drafting, peeing in public all gets punished arbitrarily. Why are rules, rules in some cases, but not others? This is just localising the issue to just this Giro as there is endless contradiction when it comes to race organisers/UCI. You can’t change Porte’s verdict because it’s happened (and Sky did not appeal it). But you have to be caught/spotted in the first place and nobody saw Meersman; there’s so much that happens in a race that nobody notices. As for the helmet, you are allowed to remove it in order to take a cap off, it is normal just as the rule about riding fully clothed does not prevent a rider from change their jersey in the event of a crash nor stop them from dropping their shorts for a pee, or in the case of Sagan in Paris-Roubaix, more. Not every foul that deserves a yellow (or red) card receives one; not every driver who speeds receives a ticket, even when caught. Rules are subject to interpretation, simple as. Hi Inner ring, thanks for the great article. Wondering if there had been precedence of 3km been extended? If the answer is yes, would the race jury/commissioner’s decision of not to do so been influenced by the race organiser which travels with them from day to day? I am not suggesting any foul play here. However, even in many civil cases, the court would round the juries up in a hotel to cut them out from un-due external influences. On the contrary in cycling, we often have far from neutral race organiser sharing the same car with commissioner/race jury all day & get cosy. All that takes is the race organiser going “I think…” and the jury’s decisions are no longer “independent”. All the while the race organiser may have only been speaking his/her mind and wasn’t trying to influence the race in anyway. Again, I am not suggesting foul play and it is only nature (or even advantageous in some cases) for our opinion to be influenced by those who are close to us. However, giving non-neutral race organiser such deep access & potential influence to race jury/commissioner really seems to be a bad idea that makes cycling seem amateurish. Of course, there needs to be some working relationship between the two and some decision by the commissioner, such as neutralising, a stage needs to be carried by race organiser. Still, the two party could have achieved the co-operation & communication needed whilst keeping a healthy distance. I wonder if anyone questioned whether the 3k markers were exactly 3k from the finish line? Sometimes these are approximated or measured using satellite data. While it is generally easy to use a measuring wheel for the sprint markers, once you are over 500m, I wouldn’t count on any measurement being precise. Not many more, that one stands and as you say the involvement of a local makes it odd. There was a case in 2009 where Contador fell in 2009 Paris-Nice before the 3km sign but because the front of the bunch had crossed under the 3km arch the incident was deemed within the 3km. I hope this article is not aimed at the moral winner being Porte! He was never going to win the Giro, he hasn’t got the killer instinct, he’s just not “hard” enough. Never going to win is easy to say now, but he was def one of the favourites. Killer instinct and “hard enough” are nothing to compare with simple bad luck and I would argue that at least 4 of the 5 or so mins Porte is behind is down to just that. A great story retold about Vietto and the belief he could have won the tour if not for his selfless acts but I humbly disagree with the assertion that in the modern age this doesn’t happen. Your Honour, I submit as my first piece of evidence, the comments section of your wonderful blog. With monotonous regularity, claims and counter claims are made that have no basis in fact. In fact, you could say that with the rise in the percentage of the population believing in conspiracy theories and the advent of 140 character snippets that people take as the gospel truth, that not since the days of the Night Soil men has mankind witnessed an era so full of crap. Add to that statements around riders who wins GT’s with ‘broken’ legs and suffer through ‘dislocated’ shoulders, the times of the general public being “often told stories of exaggeration” are still at hand, the only slight modification being that the general public can now join in. It appears, having in paragraph 2 talked scornfully of an era full of crap & conspiracy theories, in paragraph 3 you air your conspiracy theory of ‘dislocated’ shoulder & ‘broken legs’. To be taken presumably as an extension of the monotonous era so full of crap. An interesting idea, poorly articulated, superficially explored, and certainly not established in fact. It was part tounge in check. I could have used the Froome debilitating illness stories instead. I wonder if the negative reactions would have been the same? Probably but different posters. Remember though with the dislocation, the official doctors report said it wasn’t a dislocation but a subluxation so it could be said a legend may well be created around it and that that’s the way of the world and always will be. Always disappointed to see the racism against Italians in the comments. As if riders from the north don’t cheat, dope, or scheme. I can see why the extrapolation and polemic is really appealing to people as a result, but I personally can’t handle it even (especially) if I’m on the ‘moral’ side, I get too depressed about other people’s problems and the inherent unfairness of life and so on. If nothing else, watching cycling has been great because it’s forcibly trained me how to handle this, otherwise I’d still be sulking about the wheel change penalty let alone Porte’s [Australian dialect]ed knee and I’d watching Eurovision instead. Sorry didn’t mean that as a reply to Bertilak. For the record, I agree 100% with Bertilak, though I look at it less as ‘as if anyone from other countries don’t do the wrong thing’, rather, everyone is in the same environment and situation and likely have similar motivations* so generalising about a country (which as gabriele etc pointed out isn’t so likely in this case anyway) isn’t that helpful. And it is as unfounded as the conspiracy theories about deliberate crashing and the claims that if you criticise a team/rider you are biased against that rider. Both the conspiracy theories and the claims of bias are almost always made by fans of the rider concerned. Start practicing what you preach, gabriele. We read this blog for Inner Ring. Not for your long diatribes.